CRS is still hiring staff for Summer 2019!! If you want to be part of our SPECTACULAR team, check out the openings below! Click the link below to start your application today! Want to be a Chief this summer? Apply Here! Being a Chief at CRS is a unique privilege and huge responsibility. Our aim is to employ enthusiastic young men and women who are committed to growing in their relationship with Christ and to proclaiming and living out the Gospel to serve hundreds of campers and their families each summer. We strive to create a safe environment, develop relationships with our campers and share Christ in every aspect of daily life. Our summer staff is at the heart of our ministry and has a great potential to impact the campers. This is why we hire only the best staff possible each summer. What does a Chief do? Regardless of positions, all CRS staff are required to be at least 16 years of age, to have a commitment to follow Jesus Christ wholeheartedly, to place the needs and safety of campers first and foremost at all times, and to be flexible and expect to be called on to do things above and beyond what is listed in his or her job description. Check the details for specific job requirements and ages. CRS staff members are role models to our campers, and because of this, we have a set of guidelines and rules that staff must follow. We do this because what we as staff do in moderation, the campers will do in excess. We want to be wholesome, godly leaders for these campers. At CRS, we take the campers’ safety as top priority. As a result, all staff will abide by camp rules regarding curfew, automobiles and prohibition of alcohol, tobacco products or any dangerous drugs. Staff are trained according to strict guidelines by the American Camping Association as well as Ministry Safe Abuse Awareness program. To avoid conflict between parents and CRS staff, we have decided to take the conservative approach to dress, behavior and appearance. All staff is expected to adhere to our policies with a cheerful heart. Staff Application is Online Here! Counselors are the core of our relational based ministry. Two counselors live, serve, and share Christ with a cabin of 12 campers. Counselors lead activities and participate in programs with their campers. Don't kid yourself-you'll be having as much fun as the kids! An experienced lifeguard who loves water, sun, and kids! Our waterfront manager oversees the entire lakefront: supervising lifeguards, activities, and equipment. If you like horses, then this is the job for you! Our wranglers lead campers in a variety of horse activities. They are responsible for camper safety, care of horses, and facilities. At night they participate in the overall camp program! If you are artistic or crafty then this is the spot for you! Our Craft Specialist oversees the craft activities: art, pottery, and leather crafts. From coming up with fun ideas to keeping up with supplies this job lets creativity shine! Our Ropes Specialist does a lot more than hang around! He or she leads ropes course activity, trains staff helpers in proper and safe procedures, and is responsible for properly storing and care of all equipment. Excited about getting kids engaged in the world God made? Our Outdoor Specialist develops a captivating nature program to get kids excited and hands-on in Creation, takes care of the exhibits and animals in our Owl’s Nest, and leads outdoor focused activities. He or she also assists with evening programs. If bows are arrows are your thing than you might be our next Robin Hood! The Archery Specialist leads the archery and archery sports activity, trains staff, and maintains the range and equipment. He or she also assists with evening programs! These Chiefs make sure we never go hungry! Our Kitchen Krew members are the team that takes care of meal preparation and clean up, dining hall set up, and campout meal boxes! Their schedule allows time to be in an activity and assist with evening programs. Our resident shutterbug shares with parents and the world the work that God is doing through camp! Take photos and videos of all aspects of camp life, editing and uploading to our online photo gallery. Create highlight slideshows and videos each week. Campers cherish these memories long after the summer ends! 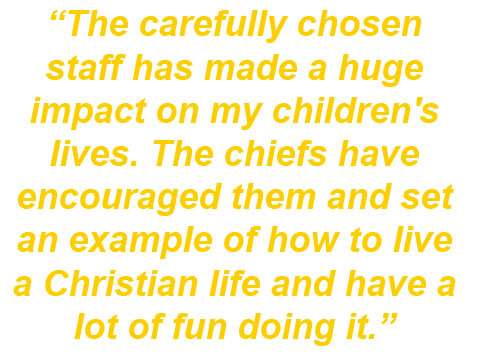 This amazing Chief cares for children of the CRS staff families. Have fun building relationships and doing fun activities with a cool group of kids (even if we do say so ourselves!) Also rotate in assisting with general camp operations, activities, and programs. She can do it all! Wonder Woman is responsible for housekeeping in our public areas, keeps camper laundry clean and dry, and oversees the snack shack of our Camp Store! On top of that she is involved with activities and camper night time programs! These Chiefs keep us looking good and working great! They serve behind-the-scenes taking care of the camp grounds and making need repairs. They also get to be part of our evening programs—everyone loves a good belly flop! If you are great at keeping things organized and running smoothly, then our Registrar could use your help! We wouldn’t make it without this behind-the-scenes Chief who helps with registration, makes sure we have all the camper and staff forms, and oversees camper mail and bunk notes! Keep our campers and staff healthy and safe! Nurse Assistants serve camp by assisting the camp nurse with camper check-in, providing first aid care, and distributing medications. Our Nurse Assistant is a true life-saver!